The search for the one magical food that will speed up the arrival of your child can either drive you crazy or change your life. 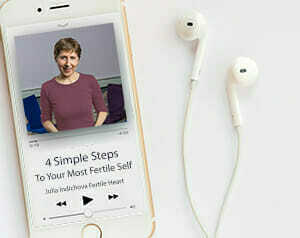 This video, which was a lot of fun to shoot, offers a quick view of how we turn food into a powerful fertility drug in the Fertile Heart OVUM Practice. Just as I was wrapping up the edit of this piece I saw a post by Katy, one of the moms in our community. Reading Katy’s note, I remembered some of the work we’ve done together in our Visonary Circles. It was great to hear about the spontaneous shift in her relationship with food as a result of her practice. In the Fertile Heart OVUM practice, food is a delicious and powerful tool. Similarly to Imagery, Body Truth and the rest of the tools it supports us in arriving at a place where healthy choices on every level come without having to wage a war with ourselves. Anything delicious you discovered to share with the rest of us? Anything deliciously nourishing you’ve done for yourself lately? Julia Indichova is the author of The Fertile Female: How the Power of Longing for a Child Can Save Your Life and Change the World and Inconceivable: A Woman’t Triumph over Despair & Statistics. The 20th Anniversary Edition of Inconceivable is due from Harmony Books in 2017. The Fertile Heart™ Ovum Practice is an original fertility enhancing program that emerged through a decade and a half of counseling. Julia Indichova’s work has been endorsed by leading reproductive endocrinologists and her story and program was featured on the Oprah Winfrey Show, Good Morning America, Oxygen, Discovery Health, Huffington Post, and other outlets. Julia’s profile is featured in the 9 People to Watch This Year (2016) Cover Story of the Hudson Valley Magazine. After 9/11 Julia initiated The 9// Bowing Project focused on applying the tools of her fertility program to the peace efforts. Hello all! I am back with my homework from last the last teleconference. I have discovered some ways to add more fun and nourishment back into my life. By nourishment too I am not just meaning food but ways to nourish the joy in my life again. My husband and I took a tour to his college this past weekend in beautiful virginia! We had a lot of fun and it inspired some ideas in me. We took a road trip on something called the skyline drive which takes you through the blue ridge mountains. We also spent the night at one bed and breakfast where the other couples there had hiked the previous day around skyline drive. I had forgotten how I loved being outside, hiking or walking. I decided then and there to look up parks in my state. I have now wrangled my husband into weekend exploring of our state in various state parks and go hiking and perhaps take one of our dogs along with us. I love being active and that has really fell to the wayside when the baby making train took over my life. NOt that I am giving up but I have really forgotten how to add joy in my life one that does not revolve around if I am pregnant or not each month. I am going to give this a try anyways! Esp now the weather is more cooperative! Thank you all for listening and being here as support! You are inspiring me to have fun, too! I find so much of what I do is what I have to do, but I need to find ways to do stuff just for fun. I’m not even sure if I know what that means anymore. But I do love hiking, so maybe that’s a place to start. Thanks for the inspiration! I loved this video. I would love for someone to say eat figs 2 times a day for a month and that will guarantee pregnancy and have that be an accurate statement. There is so much controversy and that is frustrating!! I do like the idea of listening to our bodies – not necessarily obsessing with our brains to calculate the best solution. I admit to being in my head most of the time. This last week has not been noted for being self-nourishing for me. I was very busy with my daughter – helping her to have really awesome experiences, but it was not what I would call relaxing. I tried to squeak in a few nourishing things like taking a bath here and there, but it wasn’t ideal in that way. This week is not ideal either – my daughter is still on break and lots of tasks to do, but it is better, and my body- I can feel it is gradually returning from shock zone. I am enjoying that! I’m just trying to care for myself as much as possible in the time available – even being outside and digging in the garden during some spring weather has felt pretty nice. I’ve watched the video and read the blog a couple times. And I was struggling with a post, as I sometimes do. And it came to me on the train today. Talk of good brings out my “I’m hungry” orphan. It’s funny, because sometimes in imagery or BT (where it says to let out the sound or words the orphan is making), those words often emerge. I will also (slightly embarrassing) blurt them out sometimes when I am walking down the street and my mind is otherwise engaged. It comes from a place and time when I was dealing with overwhelming grief and was literally starving myself. And I am grateful for the fact that this baby journey has healed my relationship with food and my body and helped me to birth myself 2.0. But what has also happened is that I now am able to actually “love” and enjoy eating food. Like that feeling of “OMG , this is sooooo good .” I was never really that person and I now understand that feeling. I’ve come a long way. I saw this couple of times and it so well resonated. To me, “Food” was the biggest hurdle. Couple of months back I did rigorous search on what to eat and what not to eat and what vitamins and minerals does each and every food contains and by the end of the research, I was so exhausted, lost and depressed thinking, when will the baby come? WHat am I doing? Will all this really help? etc.. But then one fine day something went off like a trigger and I automatically started choosing food from a V place. The thing that triggered was how badly I was treating my liver, my digestive track. It was not about baby or weight loss. It was genuine concern for my own body child. I decided to experiment with food. Things I hated to eat earlier (like broccoli) are now high on my list. I started liking and enjoying what I ate and surprisingly I could see how my body spoke – “Stop, enough of food, take some rest”. I could see how well my digestion was happening (no indigestion symptoms). Even now when I derail, I first say sorry to my body as I know the pressure I am causing it from ages. For the first time, I did “cutting the cord” with food, that too all by myself. I really thank my to be born babies, if not for them, I would have never ever thought in these lines and never submitted to my body child’s pleas. Currently, I won’t say I am 100% eating healthiest foods, but I am very much aware of when to stop, what to have and when am I crossing the line. This is HUGE, having the awareness and consciousness. One thing I wanted to nourish myself with was to practice to be open, not to be afraid and say its okay to be vulnerable and feel the hand of the UM on my shoulders, behind me to take baby steps without fear. I loved this video. Thank you so much for the laughs! It was just what I needed to hear today. I’ve been doing gates of love and fulfillment recently, as I’d noticed I’ve been doing some orphan related snacking over the past few weeks! But thank you Julia, this post also helped clarify some of my recent reflections on my relationship with food, and has boosted my confidence as to some of my other recent food choices that were made with awareness! Thanks Julia for this post. The 12 step cooked food addicts did make me laugh! I agree, too much of listening to people’s opinions and researching just feeds my orphan who is scared of making a mistake. I’ve spent many years trying different diets and taking lots of supplements to manage a health condition. Whilst I did benefit from some of this, I’ve realised that I can take the best supplements and eat a pretty healthy and balanced diet, but if I’m not looking after myself in other ways- emotionally, spiritually- my body just isn’t in a receptive state to use it. And that’s where FH comes in! I have become more interested in the idea of feeling connected to what I’m eating- when it’s possible to eat food produced locally and that’s in season. I’ve started getting a veg box delivered and me & my boyfriend are much more into eating veg now! I absolutely love this video Julia – thank you, and I feel so comforted by all the different posts. Somehow I had felt completely alone, and stupid, in my ‘food journey’; like I was the only one making crazy drastic changes in the hope of a cure. I can honestly say they only made my hormones more imbalanced, and made me feel more miserable, and more of a failure. Having monitored hormone levels and bbt during all of these changes I can personally vouch for how damaging some of these diets can be. It sometimes feels like my best kept secret, that is, the truthful relationship I have had with food. For the last year I have become much more aware of the effects foods can have on me physically and I’m becoming much stronger in my relationship with food and more understanding of the ‘why’s’ behind my choices and my needs – probably for the first time ever in my life (that’s many years at war with myself). I know for sure that the tools are helping with this. For the last few months I’ve felt quite a peace with food and this is a first for me. I feel so lucky to be part of this community. Thank you. Thank you for this Julia. It is spot on (plus I laughed so much when you got to the bit about the raw food guru!). Several years ago, when I had a serious illness, I did a ton of research into what I should eat. And realised that EVERYONE said something different. In fact the only possible food that all the ‘experts’ might have been able to agree on that was good for you was broccoli, but then the big dilemma, to eat it cooked or raw??? Since then I have refused to stick to any one diet and tried to eat a mostly healthy wholefood one broadly based around what I feel like (I did actually try a 10 day raw food diet one new year out of curiosity and my stomach has never been worse, which goes to show that one size definitely does not fit all). So I really welcome your approach. Thank you again, for your wise and unique approach. It feels like every time I have hit rock bottom, Julia posts something to make me think and give me reminders that I am not alone on this path. I cringed a couple of times at the beginning of the video and thought, this is me… this book says eat dairy, my TCM herbalist says dairy is the devil, another fertility book says eat only grass fed full fat dairy… same with eating nuts… one herbalist tell me nuts are toxic esp. almonds…but my TCM acupuncturist says nuts are very healthy for you… and don’t get me started on gluten free granola . I had to laugh at my own antics after a while. I think my need to be able to control SOMETHING on this path led me to really obsess over food intake, ” if I stop eating this I will be pregnant… if I start eating that I will get pregnant…”. I have literally exhausted myself emotionally and physically at this point. I will say that the nourishment that is truly sustaining me right now is the FH practice and the ladies. I have also been working on mediation practices to ground myself. You hit the nail on the head when you spoke about food being the only thing you can control. I feel the same, but it’s not just about pregnancy. When life gets stressful or crazy, food becomes the one thing in my life over which I have total control. Unfortunately, that then makes my relationship with food toxic, not nourishing. I find when I listen to myself and feed myself foods that are whole and not full of crappy preservatives or fake ingredients, I feel better. Simple (the food, the approach to eating them) seems to work best for me. H. Your words that the FH practice and the ladies is the nourishment right now hit home with me. Interacting with all of you has become a lot of my practice for me. Agree with your thoughts. Right on the spot Julia! I had tried almost every single advice, recipe, diet until last week (I got so sick with the flu) that I decided that I will follow my heart. Perfect timing for your wonderful video! Thank you for everything that you do, for all your wisdom and love. I will start loving my body-child more intensely! Many blessings! When I read the question about what I’ve done lately that’s nourished me…..it led me to something that is non-food which I posted on the forum about. What I need to continue on my journey….it’s to be social and fun me again. I was sitting home this past Saturday and my husband was working. I decided I wanted to go out and dragged my friend. We went to a local Irish bar, loaded up the juke box, and ended up dancing up a storm. It made me so happy just to be in the moment. I need more of this. Just to be normal, fun me. That is what I need to nourish me. Beautiful video Julia! This is spot on! I admit my guilt in thinking and believing in the latest fad diet whether it’s for weight loss, fertility, more energy, digestive health, etc. At first I panic because I think “OMG, I have to restrict myself of WHAT?” Then the orphans kick in wanting their chocolate, wine, pasta, lol. I have struggled with my weight all of my life and have followed many diets, many times successfully and many times unsuccessful. However, I have become more compassionate with myself and have incorporated green juices, fruit smoothies, herbal teas and more whole foods. Granted, my diet is certainly not strict nor is it the same every day/week. I have found that I need freedom for flexibility to allow my body child to get what she needs to be healthy. Yes, I do give into some cravings, and when this happens I try to just bow to what is at the moment , realizing my body child needs something more but food is what keeps her quiet (for the time being). When I began trying to conceive, I thought I needed to be on a restrictive diet jumping through all kinds of food group hoops in order for my body to prepare for my yet to be child. Obviously, each time I found out I wasn’t pregnant, I immediately thought, “I should’ve eaten THAT & I need to eat THIS.” It took me a while but I realized it wasn’t just the food intake. Julia, you said it perfectly that there is no one right diet for everybody and that we have to find what works for our own body child. I really enjoy learning about new foods and herbs to incorporated in my diet and wonder at the beauty of all these natural foods we are capable of growing. Just this past week I have been researching diets for inflammatory conditions. I have been suffering from plantar fasciitis for over a year now and conventional treatment is not working. I have to begin looking at what my body is telling me. What foods may be counteractive to the healing I have been searching for?? Is this physical pain manifesting from my emotional pain of my baby journey thus far? What ways can I help to heal my body child with the most nutritious foods? Just some of the work I’m doing now. Oh man! You hit the nail on the head once again. I can so relate to that ping-pong approach to food. I feel this overwhelming urge to follow whatever advice the latest guru claims is THE way to eat. Unfortunately, in the past I have approached these ideas as unbreakable doctrine. And this led me to feel like a HUGE failure whenever I couldn’t follow the guidelines to perfection. I met with one homeopath who said we were all being poisoned by gluten. So I tried to stop eating all wheat and I ended up filling the hunger with even less nutritional foods. Then I heard soy was perfect for fertility, so I ate so much I ended up with endometrial polyps. Veganism made my hair fall out. And all-fruit diets made my stomach hurt. Giving up all dairy made me feel bloated and puffy from all the fake protein I ate to compensate. I felt so overwhelmed and so angry; I viewed every attempt at food modification as further proof I didn’t have what it takes to grow my family. Then I began the IBOW practice and read the books, and I GOT IT! I just listened to what my body was hungry for. I’ve been a vegetarian for more than 25 years now. That has worked for me beautifully. I kept experimenting with other add-on things to find what works for me. Now I know green juices and smoothies rock, eating eggs and yogurt make me feel stronger and experimenting with interesting grains satisfies my hunger. Salads by the bucket are staples in my diet. (Thank God for farmers markets!) What really made a difference to me was asking myself: 1.) Would I let me kids eat like this? If not, then why do I let myself? I still work each day to listen to myself and not the “authorities” when it comes to food choices, but now I have tools to help me do that. LOVE LOVE LOVE this work! Julia, you are such a blessing! I don’t know what I would be doing right now if it were not for this group and your teachings. Actually, I DO know what I would be doing, and it would be not be birthing a better me. So thank you! I totally can rely with your experience with food -Thank you for putting it out there. Sending you love and good energy in your journey! oh my! I just shed a little tear :) How great to see this. It was my practice and honestly I just loved gates of love and fullfillment. It seemed to be perfect timing for where I was in my practice. Somehow the wine cravings disappeared and now the coffee craving is disappearing. Going through my schedule last night I realized a little more fully why I was perhaps craving the coffee to get through my workday. (it always seems to be only on my work days not my days off that I want coffee). I thank you for your help Julia and the support here at FH. It has helped me find my way back to myself. I will come back with my homework later but one epiphany I realized is I love animals. I love all animals: petting them, holding them, singing to them. My husband and I have 3 dogs… I love every single one. They give us great joy and one thing I LOVE to do when I get home from work is walk my dogs in our lovely large yard. I think that is more nourishing to myself than drinking a glass of wine to unwind from work. Not that I am busting on wine but I know alcohol is not the best fertility drug and I used to give myself such a hard time for not giving it up before. However that craving seemed to disappear. I will be back later with homework but I am focusing on where I can find Joy and fun. Also a little passion. Hearing Julia talk last night about how it fueled her spirit to go to those resolve meetings and helped her with wanting to write her book – I want to feel that again too. I need to find where my passion is or where I can direct it to. The call was lovely last night – thanks to all the FH sisters and our great teacher! Food is a really big one for me. I think I’m starting to learn that when my orphans take the wheel they drive straight into the fridge!